Luis Suarez scored a hat-trick as Barcelona came from behind to thrash Catalan neighbours Girona. Portu gave Girona a shock early lead, but Lionel Messi set up Suarez to equalise almost immediately. Messi took on three defenders to score, then rolled a free-kick under the wall for his second. Philippe Coutinho set up Suarez's second before curling home his first La Liga goal, and Suarez tapped in Ousmane Dembele's cross for his third. Victory meant Barcelona, who are 10 points clear of second-placed Atletico Madrid, set a club record of 32 La Liga games unbeaten across two seasons. They are only 13 games away from becoming the first team to go a full La Liga campaign unbeaten since the 1930s when the season only lasted 18 games. Girona were making their debut at the Nou Camp, in their first season in the top flight, but it was all downhill after Portu took advantage of Samuel Umtiti's lapse in judgment before firing home via both posts. 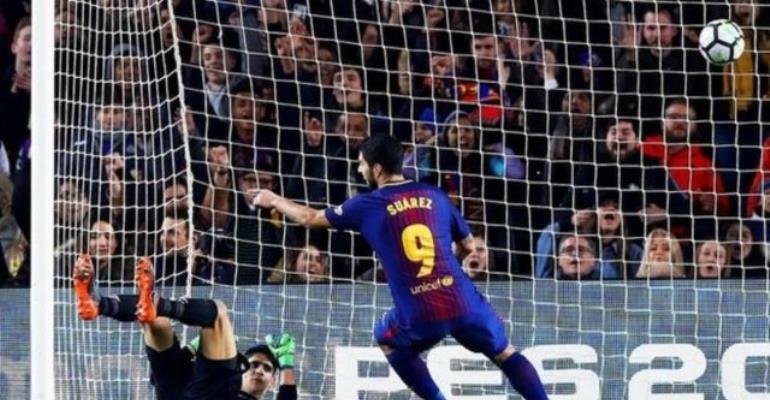 Barcelona could have won by more - Suarez hit the post, and Thomas Vermaelen had a header tipped onto the crossbar by keeper Bono. Earlier in the day, Real Madrid beat Alaves 4-0 with Cristiano Ronaldo scoring twice and Gareth Bale and Karim Benzema also netting.